Washington (CNN) – My, how the times have changed. As for Bush, his numbers have gradually edged up over the years since he left the White House, and is now on par with Obama. Both Bush and Obama have much lower favorable ratings than the two men that preceded them in the White House. Sixty-eight percent of the public has a positive view of former President Bill Clinton and 58% say they have favorable opinion of former President George H.W. Bush. Hillary Clinton's favorable ratings have steadily dropped since she left the State Department, from 67% in March of 2013 to 59% last fall, 57% in March of this year, and now 55%. The drop was expected, as Clinton transitioned from America's top diplomat to potential Democratic presidential candidate. "Secretary of State is often seen as a non-political, non-partisan kind of job, and that showed in Clinton's favorable ratings while she ran the State Department," Holland said. "In 2011, her favorable rating was as high as 47% among Republicans. Now that she seems to be running for office again, her favorables among Republicans have plummeted to 18%." The former President isn't the only Clinton who has a higher favorable rating than his wife. Daughter Chelsea Clinton's favorable rating stands at 59%, four percentage points higher than her mother. As for other first ladies, both past and present: Barbara Bush stands at 71%, Laura Bush comes in at 68% and Michelle Obama has a 61% favorable rating. The CNN poll was conducted by ORC International from May 29-June 1, with 1,003 adults nationwide questioned by telephone. The survey's overall sampling error is plus or minus three percentage points. Give Obama 2 1/2 more years to break the American spirit...and heaven knows just how low Obama's approval numbers will go.
" False flag operations are not conspiracy theories. " How sad that sounds. A lonesome cuckoo sounding his note in the wild. Yes, you seem perfectly reasonable there, fella. I'm sure you aren't schizophrenic or anything. "we need a welfare mom who has exploited and navigated the system to her own selfish gain to tell us where we're going wrong." Good luck finding one. They mostly exist in the fevered imagination of right-wing demagogues like Noot and Mitt and Rand. God, you people really do live in a plastic bubble of dreams . . .
Could some one please explain how a poll has a margin of error. Did thirty-one people click the "whatever" button? HAHAHAH love this poll.. i especially love all the typical libs on here trying to defend this obvious train wreck.. no my guys better... no my guys better.. i have never seen a bigger group of children then i do when i read the cnn ticker comments from libs trying to defend the indefensible. if it wasn't so sad, it'd be comical.. and the hypocrisy from libs when it comes to war crimes, gas prices, or foreign policy is so thick you could cut it with a knife.. It seems that CNN is buying into the Fox Fables Channel of polling. Remember how Romney was going to trample Obama? So much for accuracy. Why don't you look at the reality of Bush being put in office by the Supremes after losing the election by 500,000 votes & inheriting a robust economy which he & the GOP destroyed & Obama inherited the GOP's mess. GWB had a poll rating (Gallup) of 25% compared to Obama's 47% even after years of GOP obstruction, lies, deceit & Koch Bros. cash.. Get is straight CNN. This is not Flight 370 so try fact checking just for a change of pace. The bar was not set too high there, Let those old enough to remember Ronald Reagan's presidency compare Obama to the Gipper and vote and watch Obama go to the low teens or worse in that poll. There is absolutely NO truth or accuracy to this poll nor to this article! If you read this, 1,003 people's opinion out of 317 million Americans does not represent anything. This is meaningless! I wasn't included in this poll, so how unbiased is this poll if only some people participated? 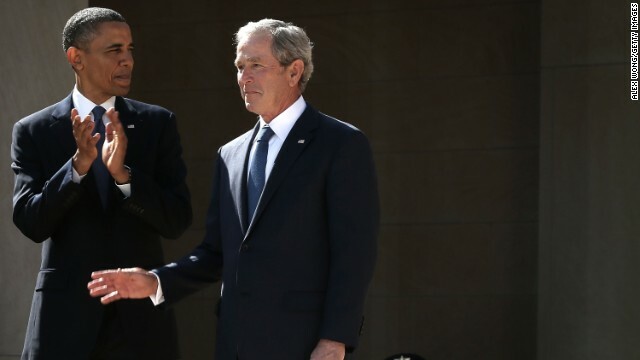 Quick quiz: why must Bush's numbers be tied to Obama? Answer: Obama apologists understand that our Commander in Chief is not strong enough to stand on his own...even in a simple posting about his poll numbers. Instead, he must be mentioned in the same breath as a real leader (i.e. a person despised by liberals (see Namepe post 201406141050)). So rather than the real story of the numbers (that Obama is fooling fewer Americans than ever before) we get some populist twist looking to see how popular Obama is compared to Bush. Not even close to relevant.